This module is comprised of four learning activities. The completion of all activities in this module may take about four 50 minute class periods. Teachers may decide to teach the entire module or to select among the learning activities. The purpose of this module is to introduce students to the country of Nigeria—the most populous and one of the most economically powerful countries on the African continent. This module will first introduce students to Nigeria by discussing its geography in Activity One. Next, Activity Two gives an overview of political entities (for example, states, caliphates, and some smaller political entities) and examples of global relations of people within them throughout Nigeria’s pre-colonial history. It is important to remember in this activity that the territory which today makes up Nigeria was not a single political entity until Great Britain grouped the northern and southern regions of Nigeria it into a single colony in 1914. Activity Two explores the various chapters of history that led up to this event, and Activity Three gives an overview of the colony and independent country of Nigeria. Finally, this module finishes with Activity Four on the rich literary traditions of Nigeria, which include a great diversity of genres and writers in both African and European languages. The learning activities are designed to be used sequentially. However, each activity can be engaged on its own. Completion of the entire unit will take approximately four 50 minute class periods. Africa is not a country! Sampling of North American and European perspectives on Africa, whether in a K-12 classroom, college lecture hall, civic or church group, almost always reveals the notion that Africa is socially, culturally, politically, and economically homogeneous—Africa is perceived as a country, and not as a richly diverse continent comprised of 54 countries and a myriad of social structures, cultural traditions, and economic practices. Unfortunately, most text-books used in middle and high school social studies classrooms reinforce the perspective of African homogeneity and uniformity. Textbooks usually treat Africa as an entity or provide chapters on two or three regions of Sub-Saharan Africa. This is in striking contrast to the treatment of Europe and Asia in the same textbooks where it is the norm to have separate chapters on selected countries (e.g. China, Japan, India, Britain, France, Germany, Italy, etc). Exploring Africa provides an essential alternative to the perspective of African homogeneity by accentuating the reality of Africa’s political, social, cultural and economic diversity through the detailed study of Nigeria and nine other important African countries. Recognize and celebrate Africa’s rich diversity. An in-depth study of Nigeria and country perspectives from all regions of Africa facilitates knowledge and understanding of the rich diversity of African political, economic, cultural and social realities, traditions and practices. Countries are important: In spite of the growing political importance of globalization, the nation-state remains the primary and most important political entity in the early twenty-first century geo-political world. This is true in Africa as it is in Europe, Asia, and the Americas. 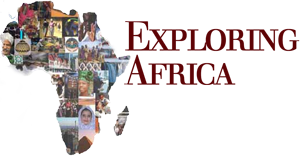 Through the comparative study of Nigeria and the nine other selected African countries students will gain an understanding and appreciation for the similarities and differences among African nation-states and between African states, their own country, and countries in other regions of the world. Throughout this lesson numerous photographs will be used. It is important to remember that these photographs do not represent the “way things are” in Nigeria at all times and in all places. For example, a photograph of a clash between Nigerian police and opposition protesters, while representing an actual event that occurred, is not representative of the norm of political interaction in Nigeria. Such a photograph is just one among many possible representations of political interaction in contemporary Nigeria, just as a photograph of police using violence against anti-globalization demonstrators in Miami in December, 2004, while an accurate representation of that event, it is not an accurate representation of the norm of police-community relationships across the U.S. Photos are used in this lesson to help illustrate the geography and history of Nigeria, and social, political and economic activities and practices in contemporary Nigeria. They do not represent a uniform way in which Nigerians engage in these activities. What kinds of land, climate, and waterways does Nigeria have? What is the history of how Nigeria came to be the contemporary country of Nigeria? How has Nigeria been a part of other political entities, and connected to other regions of the world throughout its history? What are some of the literary traditions of Nigeria? A clearer understanding of the geography, history, and cultures of Nigeria. A more comprehensive understanding of the history of how Nigeria came to be a country. An historical perspective of other political entities Nigeria used to be a part of, and of Nigerian global relations throughout its history. Knowledge of some of Nigeria’s literary traditions. Begin this module with Activity One or select from one of the other activities.